Become a Work At Height Competent Inspector / Installer / Rescuer by attending our courses and meet the standards stipulated by WSH Act. We are proud to be the FIRST training centre to be granted training funds for the running of these courses in Singapore. Multiple Award Winner - 2014 Most Innovative Product and ISHN Readers’ Choice Awards! You live on the edge. We'll keep you safe! 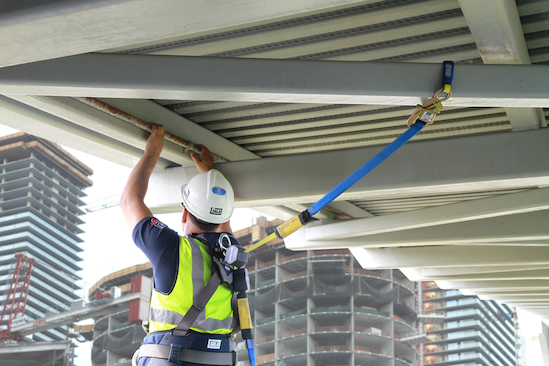 Capital Safety has revolutionized the Fall Protection industry again with the Nano-Lok™ edge Self Retracting Lifeline! It's specifically designed for foot level tie-off and sharp leading edge applications. This ground-breaking new product includes an 8 ft. (2.4 m) working length, is ergonomically designed for comfort, and is available in single and 100% tie-off configurations. 3M Fall Protection Training Programs now feature a virtual reality component. Have a go at working or falling from a great height without any risk or injury, right here at our state-of-the-art training centre, when you sign up for our LSP training courses. For all objects at height - including humans - the focus always should be on preventing things from falling rather than on catching objects, or on limiting the damage after they fall.